AuPairCare, based in Northern California, created an event inviting au pairs to participate in California’s annual Coastal Clean-up, a major volunteer effort to clean up shores and waterways. AuPairCare’s event, titled “Better Than You Found It”, gave au pairs the opportunity to experience the volunteerism that is an integral component to American culture. 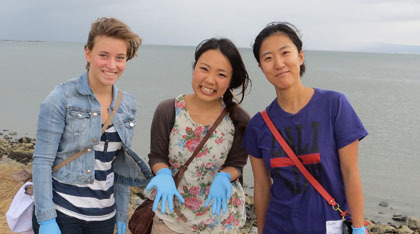 Au pairs met early on a Saturday morning with their Area Director, collected their gloves and buckets, and combed the shoreline for trash. Participants were offered breakfast with the other volunteers, and after the clean-up was complete, everyone enjoyed a free barbecue lunch. Other “Better Than You Found It” events have taken place at San Francisco’s Ocean Beach, the Berkeley Marina and along the Sacramento River. AuPairCare field staff members in the Northern California region all agree that it’s a great event that will continue. It gives the au pairs an opportunity to interact with other Americans of all ages and contribute to their adopted community as well as the world in which they live.